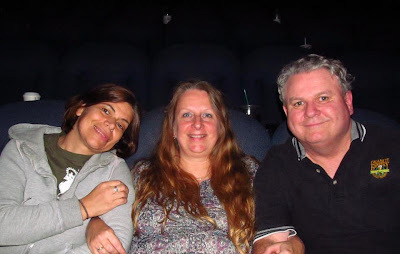 Tonight Teena, Trish, and I saw Seven Psychopaths. A struggling screenwriter (Colin Farrell) who inadvertently becomes entangled in the Los Angeles criminal underworld after his oddball friends (Christopher Walken and Sam Rockwell) kidnap a gangster's (Woody Harrelson) beloved Shih Tzu Bonny(played by Bonny). Going in I had heard that it was a bizarre movie but knew little about it except what is written above. That really is all you want to know. The movie is very bizarre, with many twists and turns and sometimes a little confusing. There is lots of humour in this film. I found myself laughing, then shocked and always taken in by the plots and subplots. I really do not want to say more as I wouldn't want to spoil anything. Many people, even trailers for movies, are ready to give away the plot or twist. I will not. 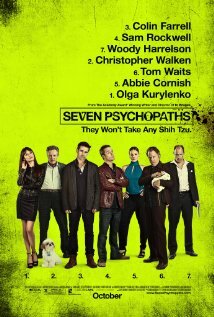 I will only say that I really enjoyed Seven Psychopaths, that it is well worth seeing and look for Christopher Walken to get a Best Supporting Actor Nomination. I give it a 7 out of 10!